The group is determining the migration pathways of the Scoter to learn the location of their breeding and molting areas during the birds' lifetime. In this way, the U.S. government with Canada will address and protect the sensitive habitats for the birds. A couple of special researchers: Alicia Wells, a graduate student, and Edward Lohnes, who helps to coordinate the program, are also with the Patuxent Wildlife Research Center. They spend time learning about the nutrition and behaviors of the animals before, during, and after they track them! In this way the natural resource agencies will be well-informed. 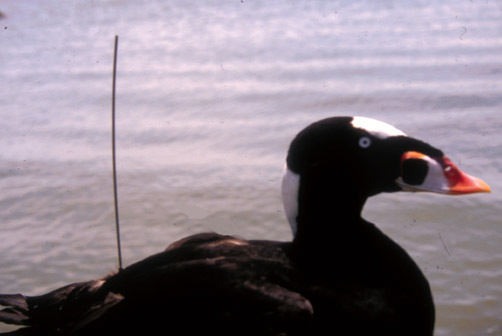 The study which began in 2001 has a great future, and efforts to outfit the Scoter are ongoing in the Chesapeake Bay area off of the coast of Maryland, and in the colder Canadian waters off of New Brunswick. The Group is known for its newly developed techniques for capturing and studying the birds, and the cutting-edge research they are doing online with Signals of Spring is a model of excellence to be emulated! 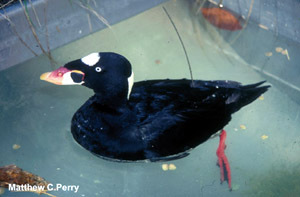 The Scoter live off of the U.S. East Coast in the winter, and arrive in Canadian molting and breeding sites in late spring. Track them with Signals of Spring!